These are my version of Cinnabon Cinnamon Rolls and this recipe was originally featured on Vegan Mainstream for Vegan MOFO. In a large bowl dissolve yeast in warmed almond milk. Add remaining dough ingredients except flour and mix well. Add flour one cup at a time until dough is no longer sticky. Lightly flour hands and begin kneading dough. Knead into a large ball. Keep in bowl, cover and let sit for at least an hour in a warm place so dough may rise. Once dough has risen preheat oven to 400 degrees. Roll dough out on a lightly floured surface until it is approximately 21″ by 16″ and approximately 1/4″ thick. For the filling spread the softened butter over the entire surface of the dough. Mix the cinnamon and sugar together in a bowl and then cover the butter with it evenly. Carefully roll dough starting on the bottom long end and roll all the way to the top. Cut roll in 1 1/2″ slice and place on a baking sheet greased or covered with parchment paper. Bake for 12 minutes or until light golden brown. While rolls are baking make icing. Beat cream cheese, maple syrup, and butter well with an electric mixer until well blended. Slowly add in powdered sugar. When rolls are done and still hot, generously add icing to each roll. Eat. A napkin and a glass of milk substitute of your choice, coffee or chai are recommended. 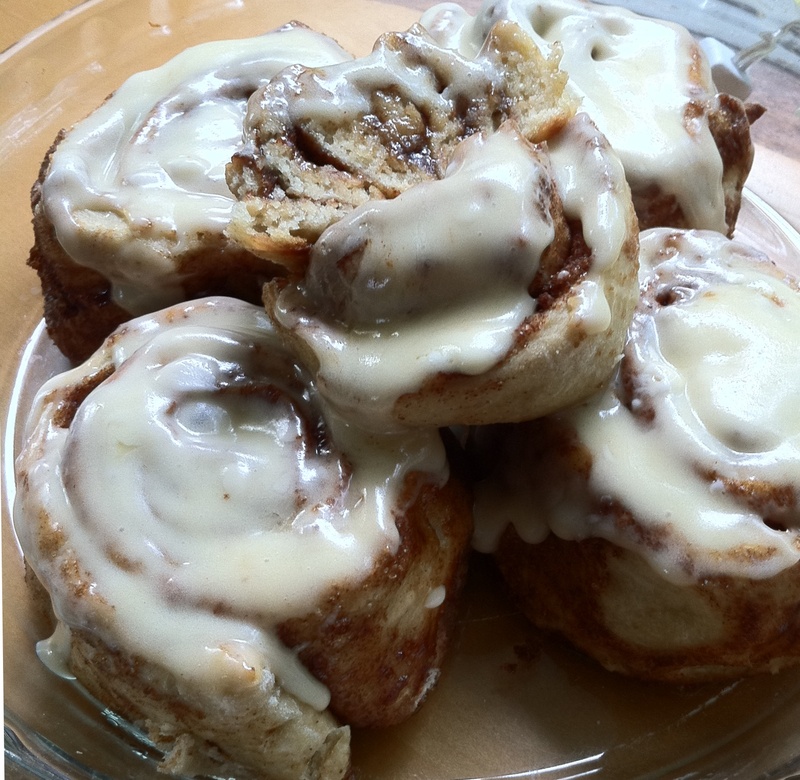 Gallery | This entry was posted in Bread, breakfast, dessert and tagged cinnabon, vegan. Bookmark the permalink. These look so decadent and amazing! I’m allergic to Cashews and other nuts 😦 any idea on what I could sub in for the heavy cream? I would double the amount of butter. The cashew cream is not needed I just like the creaminess. You could also replace it with vegan cream cheese. I’m allergic to cashews as well… would something like coconut creamer work well, or is that not thick/creamy enough? This recipe looks amazing, I can’t wait to try it! Yeah, I’m allergic to anything that could possibly be considered a nut, except coconut. It’s pretty easy to work around, though. I’ll give these a try with some vanilla coconut creamer and let you know how it turns out!